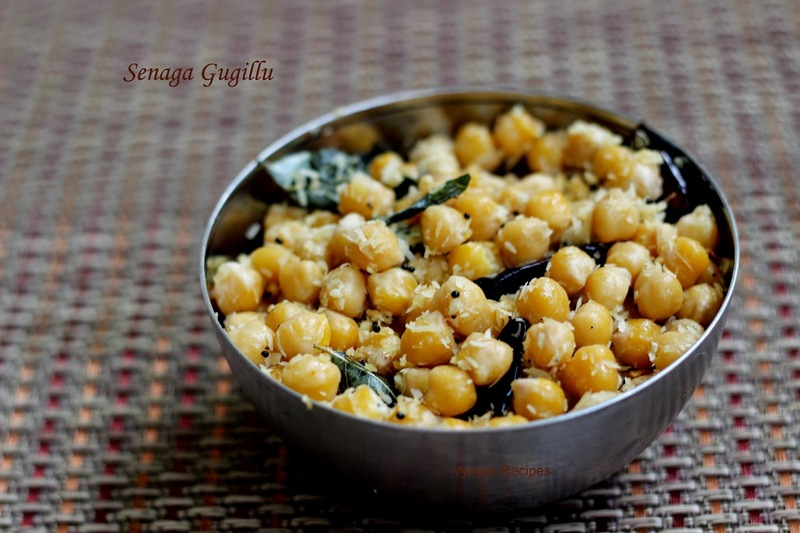 Tempered Chickpeas is made during all the festival Occasions.It is an Indian festival recipe. It prepared during Varalakshmi vratham,Ganesh chaturthi, and during Navarathri Occasions.In most of the temples, it is also offered as prasadam. Channa is also a rich in fiber content, which promotes the health of the body. White chick peas - 1/2 cup. Soak the chanadal overnight or 7 - 8 hrs. boil chana dal till it is soft nearly 5 to 6 whistles. Heat the oil, add mustard seeds, when it splutters add urad dal, curry leaves and red chillies. When dal turns golden brown colour , add cooked chana dal ,saute for few minutes till moisture in it evaporates, then add grated coconut, and salt. Mix everything well. Then remove it from the flame. Now gugillu(sundal) is ready.